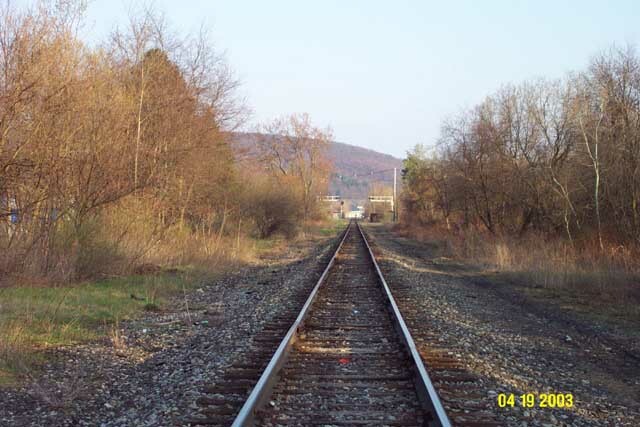 Tracing the ROW of the DL&W railroad in South Waverly PA. There are a LOT of images on this page! I apologize to dial-up users! 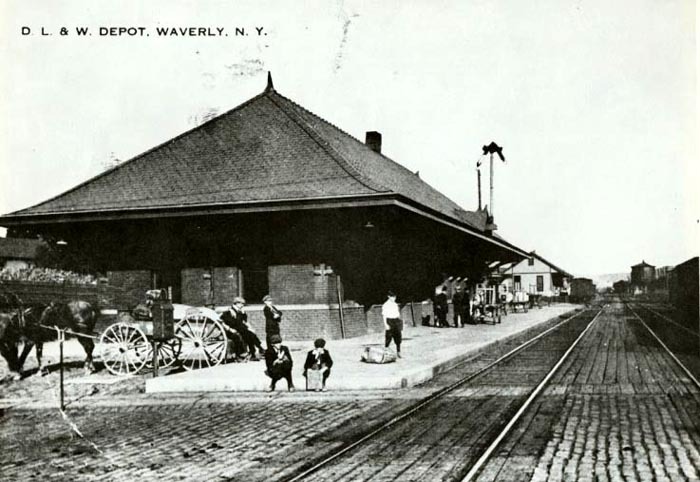 The Delaware, Lackawanna & Western Railroad ran from New York City to Buffalo. on Fulton st. until the end of passenger service in the 1950's.. 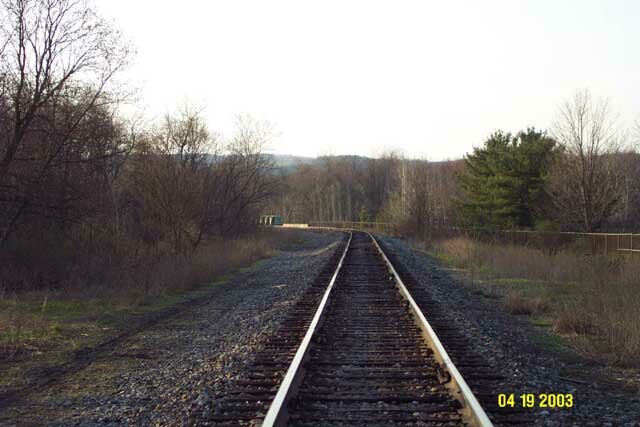 The DL&W and the Erie railroad were rivals who paralleled each other through much of the Southern Tier of New York. In 1960 the 2 railroads merged to form the Erie Lackawanna railroad. The Erie route was retained in this area, and the DL&W line was abandoned. was built on a good deal of the ROW of the DL&W in the early 1970's. 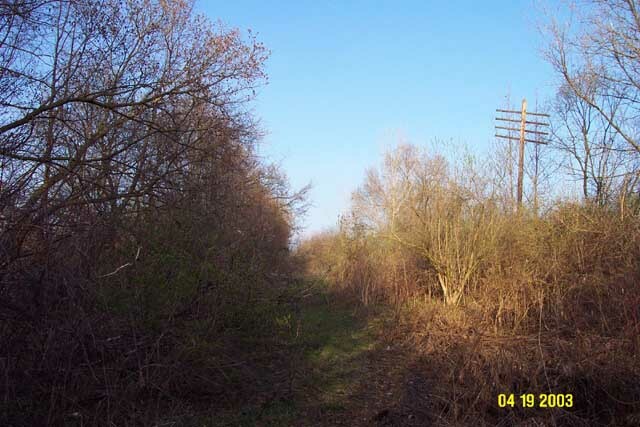 There is however a small stretch of DL&W ROW still visible in the valley, this is the line we are going to look at. Lets start at the site of the DL&W station on Fulton St.
Im looking South, the building on the Right edge of the photo is Yanuzzi's resturant. Thats route 17 passing over Fulton St. 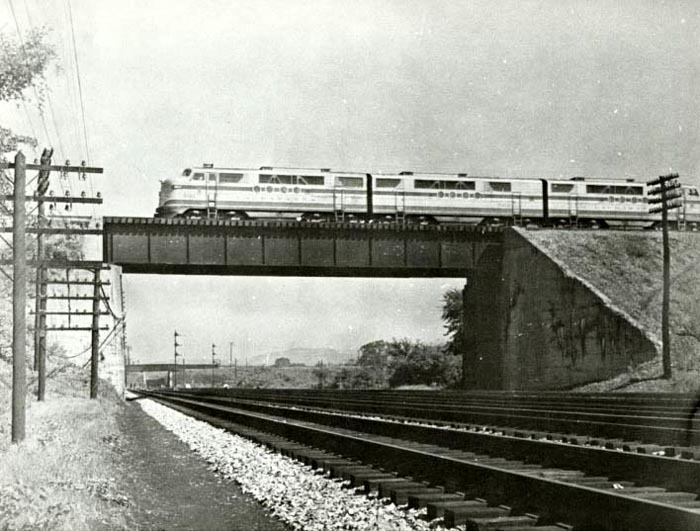 The DL&W ran East - West exactly where the route 17 bridge is today. except the tracks were at "street level" with Fulton st..not elevated as route 17 is today. The station was in the North East corner..basically in that parking lot across the street. At this point, we are in South Waverly, PA. 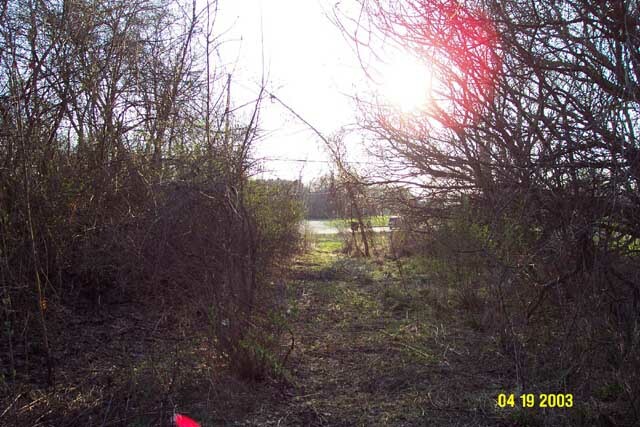 Here is a closer view of the same area. still looking South. The station was essentially where that black mini-van sits..
perhaps buried inside the route 17 fill. but it was at that NE corner of the tracks & Fulton St. There is no actual ROW visible through here, because route 17 totally wiped it out. of Fulton St. The DL&W ROW crossed Fulton st, at grade, basically right under these bridges. 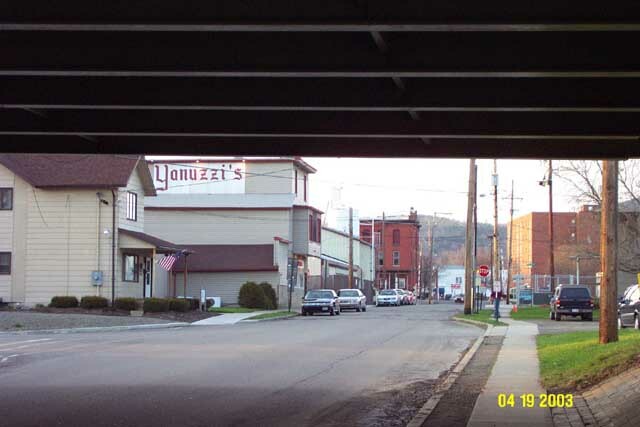 Yanuzzi's is in PA. Those brick buildings in the background are in NY! Im probably standing right on DL&W tracks at this point. 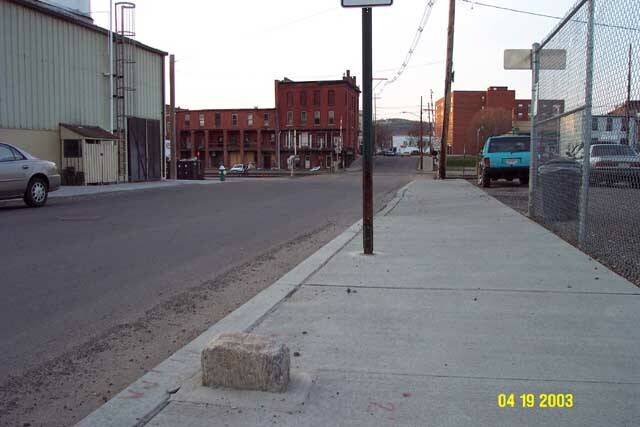 Further north still, and leaving the DL&W behind for a few minutes..
See that stone sticking up out of the sidewalk? 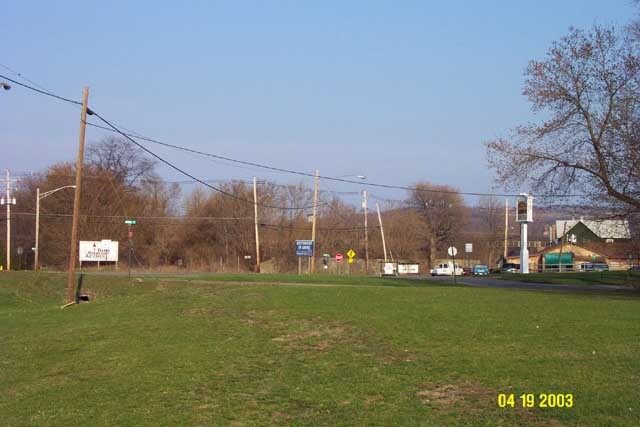 that is the ACTUAL NY/PA border! 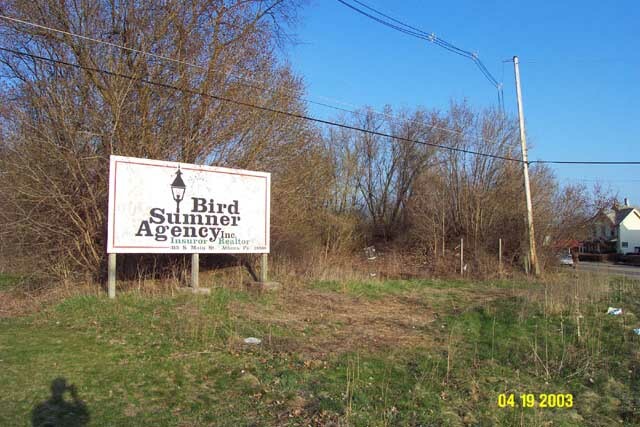 other side of the block it is New York State..
Souther Tier main. D&H/CP trains also still use this line. To the left is the Leprino Foods plant. the state border passes THROUGH the Leprino buildings! Now we are fully in Waverly, NY. This is the Erie crossing at Fulton St. looking North. Broad st, in beautifull, thriving, downtown Waverly NY. I paced a D&H/CP train with EIGHT engines! Seven CP SD-40-2's and one Cotton Belt GP40..but I couldnt get into positition to get any pictures..
naturally, while I was right here at the tracks, no trains came through! 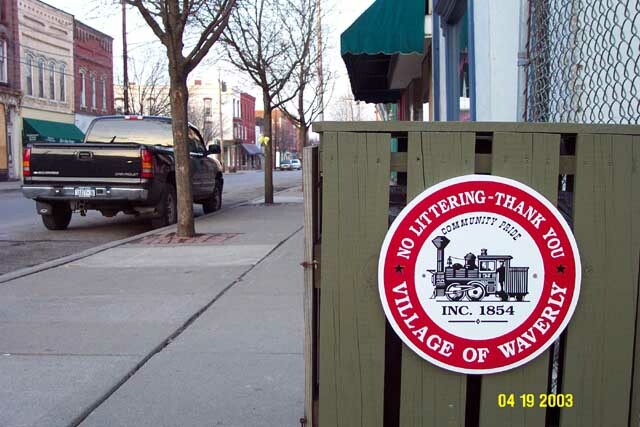 Taking a quick walk up to Broad st. check out Waverly's town logo! Ok, getting back to the DL&W. Now we are maybe 1/2 mile further East from Fulton St. 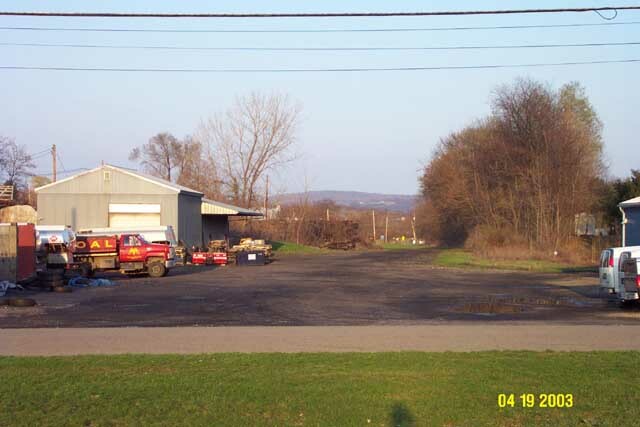 This is the "John H. Murray & Sons DL&W Coal" facility. This is an ancient Coal trestle. 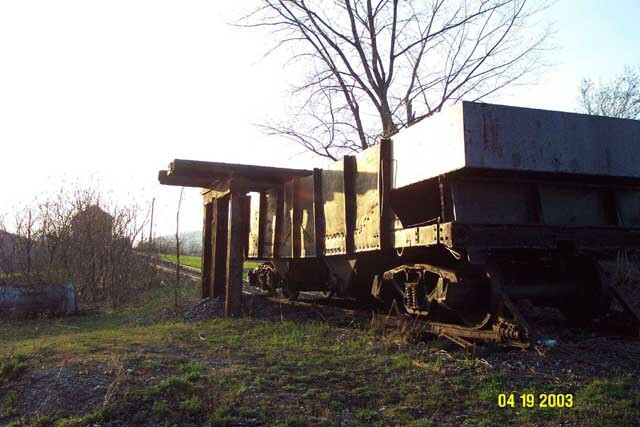 one of the Valley's major remaining railroad artifacts. from the chutes still visible along the bottom. This view is looking East. 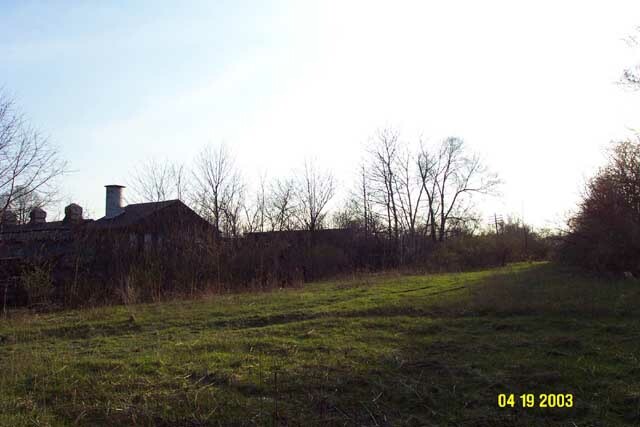 Here is the north side of the structure, looking West. The bus is heading east on Route 17. 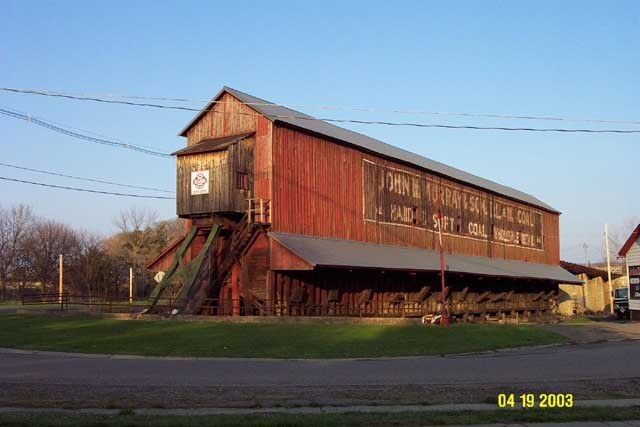 The ROW is on the other side of the structure, the South side. There is still a track leading up into the building! view is looking west. 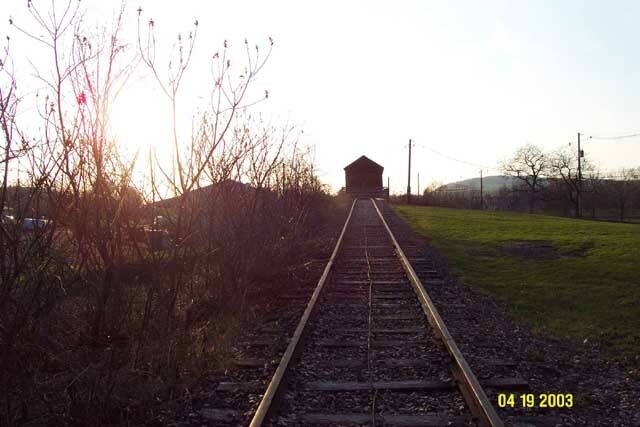 And at the end of the track sits an ancient hopper car. There are no identefying markings on the car. That car has been there since the DL&W tracks were torn up! Here is the ROW of the DL&W again. Looking east. 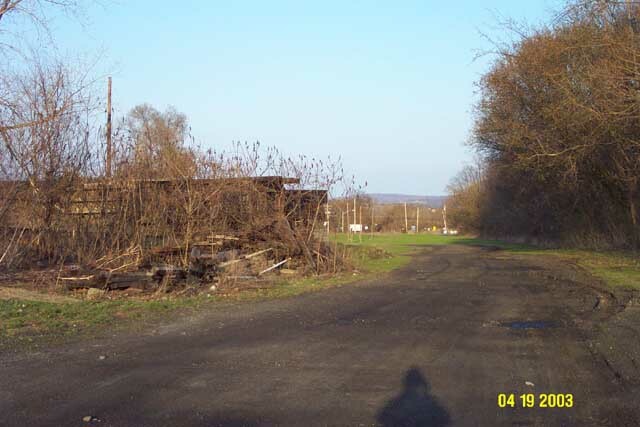 The ROW passed behind the coal trestle, to the South of it. That black road heading off into the distance is the actual DL&W ROW. This is the Western end of the tracable DL&W ROW through South Waverly. Here is a telephoto view from the same position. still looking East. We are looking straight down the ROW towards "Bananna curve" in the distance. Walking a few feet East, and turning around 180 degrees looking down the ROW towards the west. 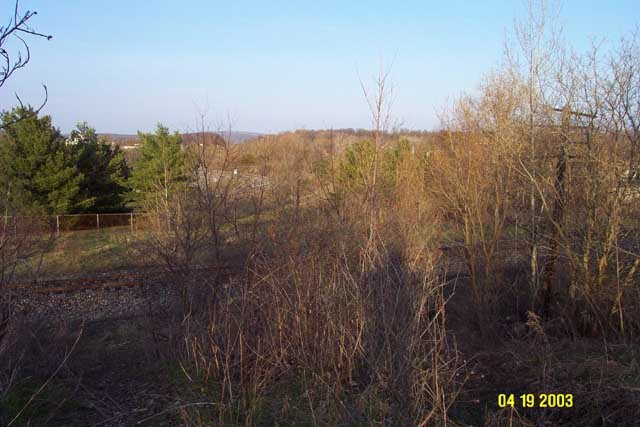 The coal trestle is to the right (north). I am standing directly on the ROW. 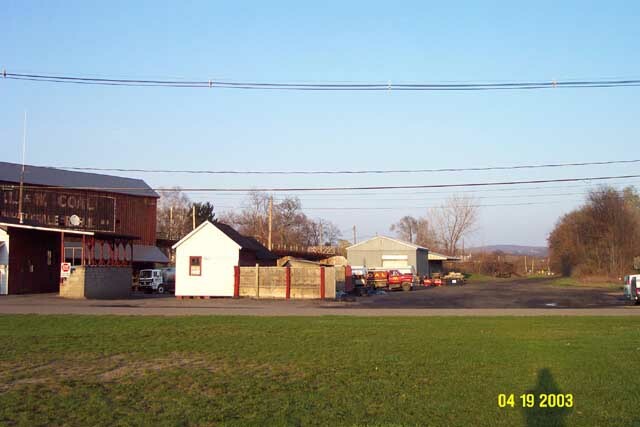 This field has been the home of the annual S. Waverly carnival for many years. 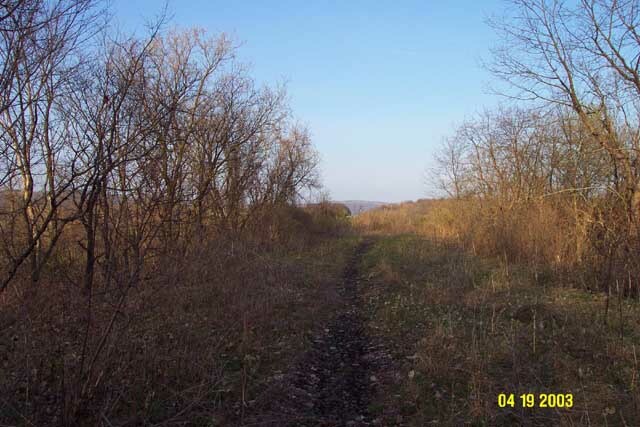 towards the Station, which was just south of the Leprino plant. A few more feet East..looking East, at the East end of the coal trestle. That hopper car is hidden behind the brush to the left (north) of the ROW. and the Blue "birthright of Sayre" sign in the center. Pizza Hut is behind the green house on the right edge of the photo. closer...now you can see where the ROW passes into the trees, just to the right of the white sign. The ROW was elevated at this point, the tracks passed OVER Keystone ave on a bridge. Here is a view off to the north side of the ROW, looking south. The Bridge passed right in front of this scene, the tracks heading off into the trees. You can just see a bit of the red roof of Pizza Hut. Now we head into the trees, and the actual ROW becomes visible again. Notice the DL&W telephone pole! there are 2 of them still standing on this stretch. they were along the South edge of the ROW. Turning around and looking West. Keystone ave is visible at the end of the trees. Walking further East. looking West down the ROW. Ajax foundry is the building in the background. At this point a short connecting track diverged south from the DL&W and connected to the LV-Erie line. of the connecting track to the LV. land. it drops down sharply on both sides. End of the Line! 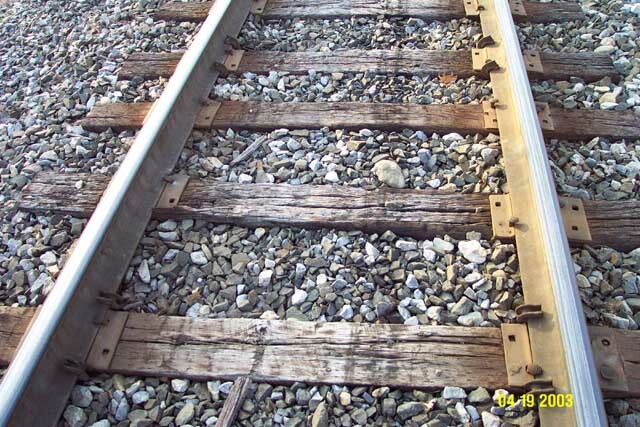 This is where the DL&W ROW reaches the LV-Erie track. 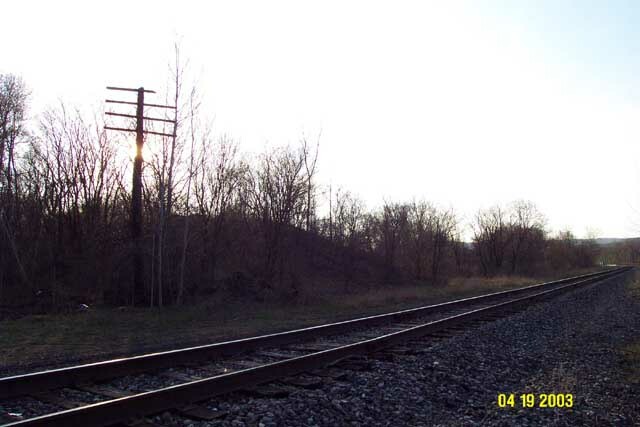 (The LV-Erie track is the short connecting track between the Sayre yard and the Erie in Waverly. This view is looking East, the DL&W would have passed over the LV at this point on a bridge. the DL&W is obviously high above the LV at this point. The Guthrie Inn is just out of sight on the right edge of this photo. Across the LV tracks the DL&W ROW is lost in the Route 17 exit ramps. 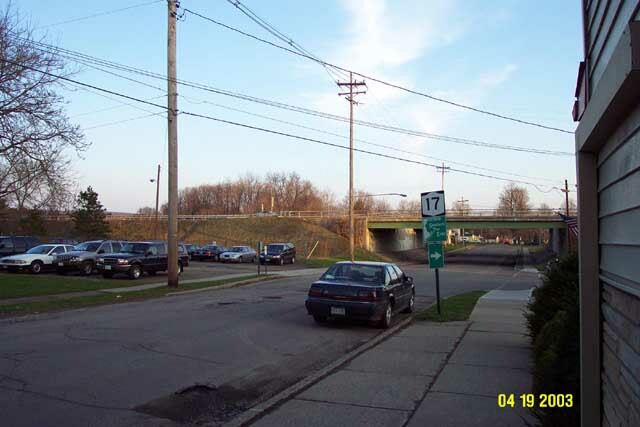 that the DL&W and the current route 17 did NOT cross the Sayre yard at the same point! 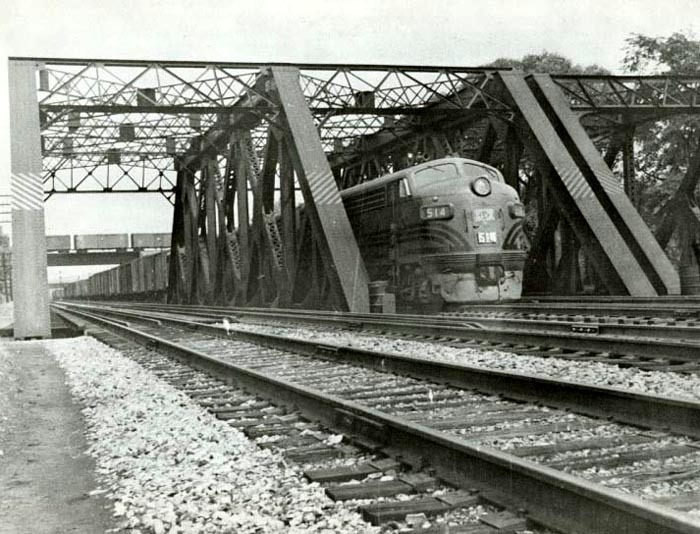 The DL&W bridge would have been a bit South of the current Route 17 crossing. 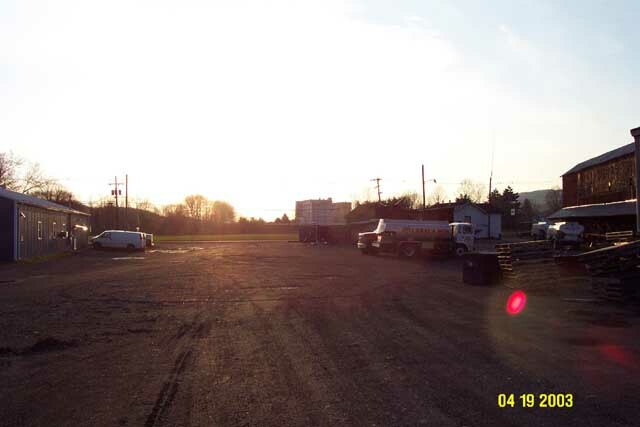 Notice the second DL&W telephone pole on the right side of this picture. Scrambling down the hill, down to the LV tracks. From the same position, looking West. 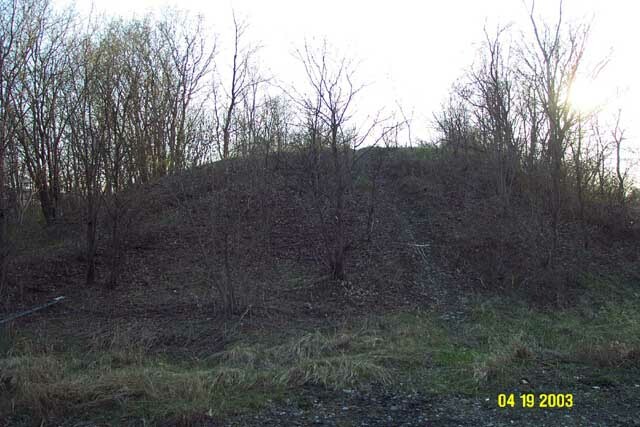 This hill is the elevated DL&W ROW..
the DL&W would have crossed over the LV on a bridge at this point. 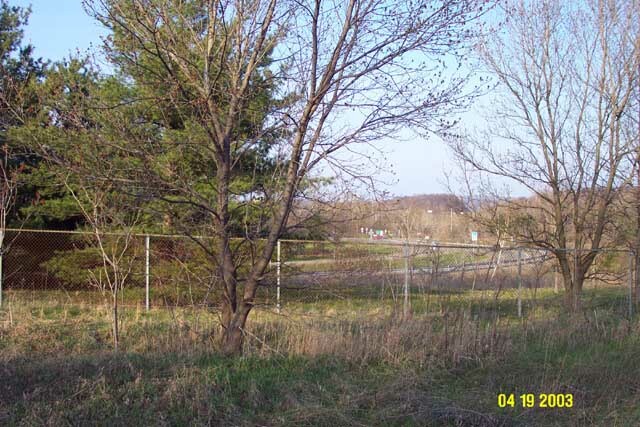 This is the Eastern end of the tracable DL&W ROW through South Waverly. Same position, looking East. The DL&W ROW is lost in the exit ramps of route 17. Same position, looking South. Toward the Sayre yard. Same position, looking North, towards Waverly. 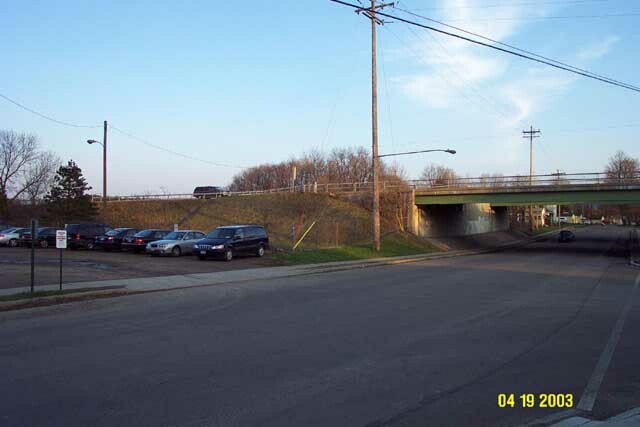 The green bridge carrying the tracks over route 17 is just visible. Last photo of the tour! 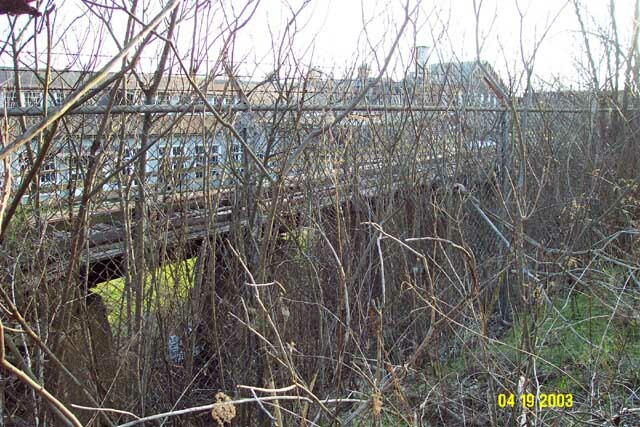 A view of the elevated DL&W row, a few feet to the south from the previous images. there is the second DL&W telephone pole again. still on the south side of the ROW. 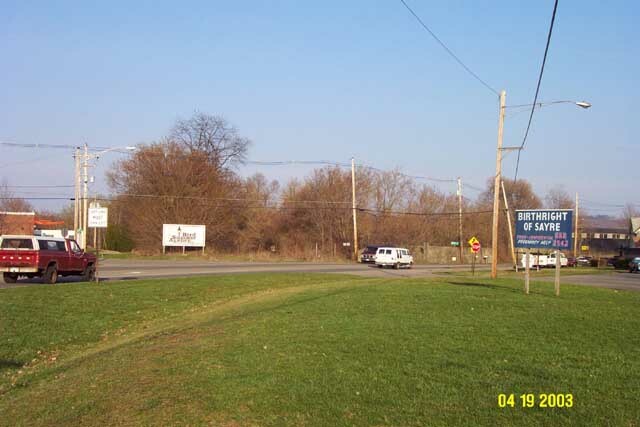 That pole is visible as you drive by the front of the Guthrie Inn, and past the route 17 exit ramps. in S. Waverly PA. 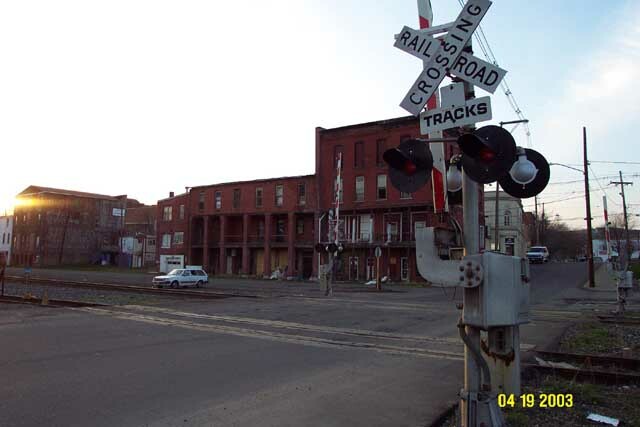 This shot is looking East down the DL&W main..
Fulton st. is crossing the tracks right in the foreground of this photo. 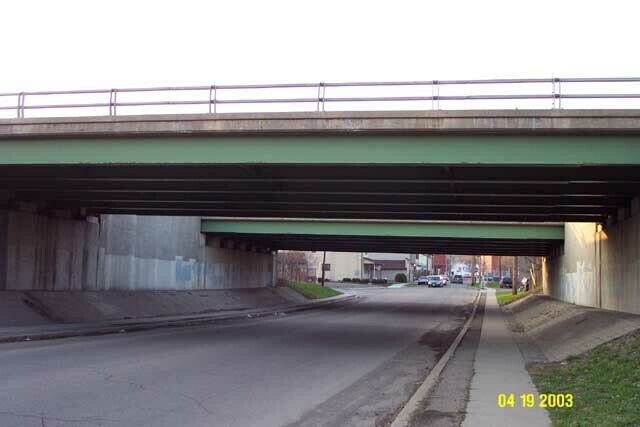 Today the Route 17 bridge crosses over Fulton st at this spot. the LV train is heading South into the yard, going over the bridge over the creek. There is a train going over the DL&W bridge in the background. and in the far distinance is the Erie bridge. 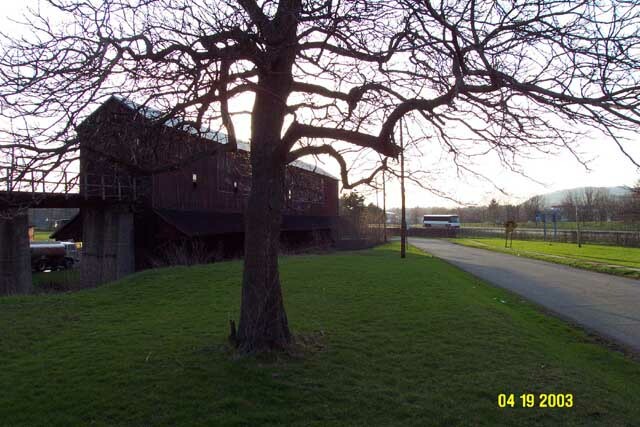 and here is the same scene, but up next to the DL&W bridge. Still looking North. again the Erie bridge is in the background. Well thats it for now..hope you enjoyed this look at the last sad remnants of the DL&W in the valley. of the DL&W bridge over the Sayre yard. If I find anything I will add then to the end of this page. Check out this aerial photograph!! The DL&W ROW is quite visible. Here is the un-marked photo. Here is the same photo, but I drew in the ROW and other landmarks. (I spent lots of time carefully drawing all the ROW's and labels with nice neat red letters..
oh well..its still mostly readable..I might re-do it...someday. check out the other tours.